Jilda and I recharged our batteries today. We slept in and stayed close to the house for the most part. We took a walk before noon while a pot of beef stew that Jilda had whipped up, simmered. I took a scoop of corn and placed it in a small pile under our apple tree. We left the back doors open to let the fresh air have its way on the interior of the house. The sky was overcast and the air was cool on my arms. Soon it will be sweater weather. When we stepped on the back deck after our walk, I could smell the stew and it made my mouth water. After lunch, we took a nap and I awoke to the sound of rain on the front glass. 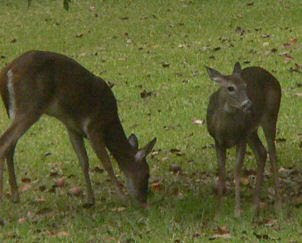 I walked to the kitchen for a glass of tea and I saw two deer munching on the corn we'd left. I grabbed my big camera and shot this picture. We're torn between whether we should continue feeding the critters even though deer season is fast approaching, or stop feeding them. We don't hunt but a lot of folks do. I'd rather not lure them here from somewhere else...through the line of fire. On the other hand, if feeding the ones who live here keeps them from wandering into the line of fire, then it's a good thing....right?